The EOS 6D features a newly-designed 20.2 Megapixel full-frame CMOS sensor, Native ISO range of ISO 100-25,600 (extendable to 50-102,400), new 11-point AF system also offers the strongest low light performance of any Canon AF system to date. With focusing down to EV-3, the equivalent of moonlight, subjects remain in-focus in even the most challenging lighting conditions. powerful DIGIC 5+ image processing offers a host of automatic modes and creative shooting features, complementing full manual controls to offer total flexibility to a wide range of users. Other new features include, HDR mode enables the capture of both highlights and low lights in tricky lighting conditions, while Multiple Exposures allows photographers to combine up to nine separate exposures into a single image in-camera, creating a dramatic effect in the final picture. EOS 6D provides full manual control over exposure and audio levels while recording video. The camera features NTSC and PAL video modes at multiple frame rates, recording 1080p at 30 (29.97), 24 (23.976) and 25 fps, 720p at 60 (59.94) and 50 fps and standard video at 30 (29.97) and 25 fps. The camera provides up to 29 minutes and 59 seconds of continuous recording (with 4GB automatic file partitioning) in selectable All i-framei or IPB compressions with embedded timecode. Canon 6D also features better display, Built in GPS and WiFi. 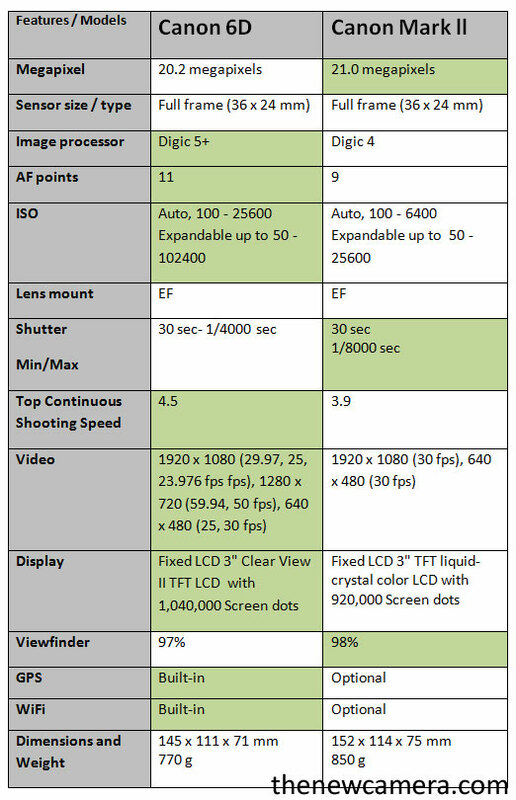 Canon 6D have better Sensor, more ISO range, advance Image processor, fast continuous shooting speed, better video mode, High Resolution Display unit, In built GPS, WiFi at a price similar to 5D Mk II. I’m considering a Canon 6D. Will it require that I upgrade Photoshop to CS6? I only recently upgraded to version CS5 and would rather not take on the unneeded expense. I believe CS5 will be sufficient for the Mark II. Correct? I’m not sure I see the correlation between camera model and Photoshop version. There’s no reason to upgrade to CS6 because you change cameras. You’re only processing the image from a camera, any camera, in Photoshop. I never use CS5, maybe once in a blue moon, I use Lightroom. The 6D is one Heck of a good camera. It’s so good with night shots… wow!